Arturia has announced its first ever analog drum machine. So what is the goal with this unit? What are my thoughts? Here is what I can say, In my opinion this is what the roland TR8 should have been. an all analog drum machine with both step and real time recording that provides the booming sounds of the 808 and 909 (Plus many all new circuits) at an affordable price point and with individual outputs per voice. 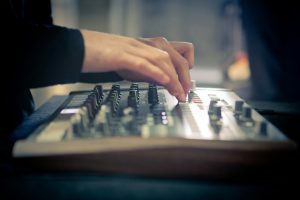 This isn’t Rhythm wolf low stripped down rushed out low quality, instead its a group of high quality drum circuits (take a look at the engineers credited in the manual) paired with an updated version of the beat step pro sequencer. This sequencer really has some cool tricks up its sleeve like ratcheting and timing shift per step. Think of that like swing on steroids. Random from the beat step pro also appears and to top it all off you have a global steiner parker filter to get your sweep on. Everything syncs via modular clock or midi clock so you can pair it nicely with your modular… yep you can clock it from your modular or have it clock your modular!. Another point of note is this drum machine has proper voicing… what I mean by that is the Snare and clap actually punch through a mix unlike many of recent analog drum machine releases in the lower price range… these snares actually crack hard! couple that with some 808 and 909 inspired (and also improved) designs for the kick and you have a pretty powerful unit. The reverse cymbal is a new sound not yet heard in an all analog drum machine, and the tambourine and shaker sounds are really impressive (not just ho hum pass over sounds like on many other drum machines). Over all at this price point I am very excited to see an all analog drum machine. Hope to have a review unit soon! 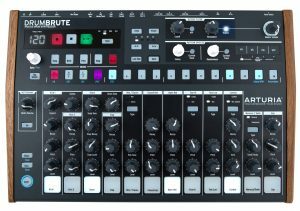 Arturia are excited to announce the arrival of DrumBrute – a 100% analog drum machine & sequencer designed with performance and in-depth sound editing at its heart. 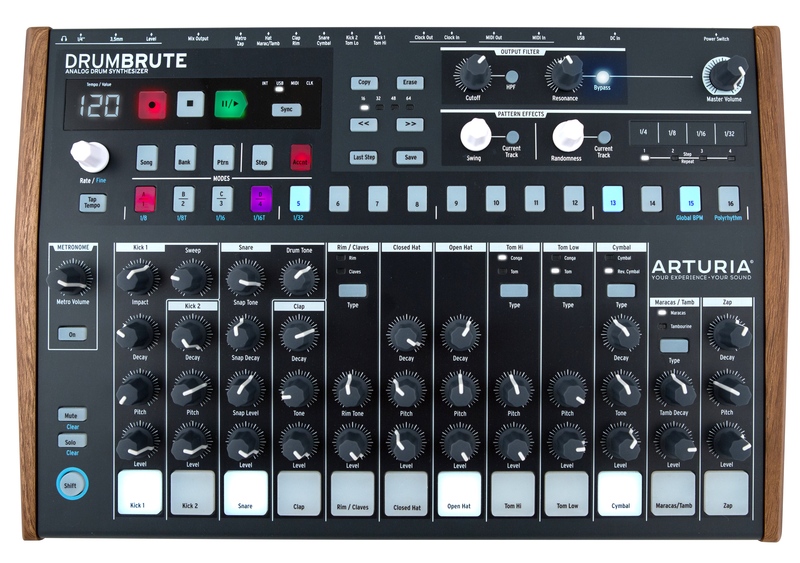 The newest member of Arturia’s Brute family, DrumBrute is a powerful beat-making instrument that carries the savage DNA of the MicroBrute, MiniBrute, and MatrixBrute. Most people are aware of my affinity for finger drumming and live performance, so it shouldn’t come as a shock that I want to preform live unsequenced finger drumming with my Modular system. However when I began setting up patches to do this sort of thing I ran into a problem. I wanted to use 1 module for both open and closed hi hats, while triggering this single module from 2 gate sources without running into the issue of the closed hi hat opening up the decay envelope. ENTER LOGIC. In order to complete such a task I need to separate the closed hi hat trigger from the open hi hat trigger (while there is only one trigger input on the module). To do this I use the Animodule XXX_or . This module allows me to send two separate triggers to the same destination and other destinations without the risk of back feeding and having the closed hi hat trigger the decay envelope. Normally this back feeding wouldn’t be an issue if I was simply using a sequencer, but in a live performance real it is important that the open hi hat pad and the closed hi hat pad both trigger the sound independently. Take a look at the video below to see how I did it. The Arturia BeatStep is a wonderful little midi controller and Sequencer. When I first purchased it I had the intentions of using it as both a nice little sequencer for my analog synths and other gear. I also had considered using it as a dedicated controller for my Moog Sub Phatty. Why you ask? Well the Sub Phatty has a plethora of hidden features that must be reached by complicated button presses from the from panel or a VST editor. With the Arturia BeatStep I am able to control all of those functions with direct hands on control just as you can on the Moog Sub37. In recent videos I have seen people wowed by the Sub37’s wonderful looping envelopes. I often here people wishing for those envelopes on their Sub Phatty… little do they know they already have them! yes thats right the Sub Phatty has those same envelopes just hidden! To see it in action, Check the video out.